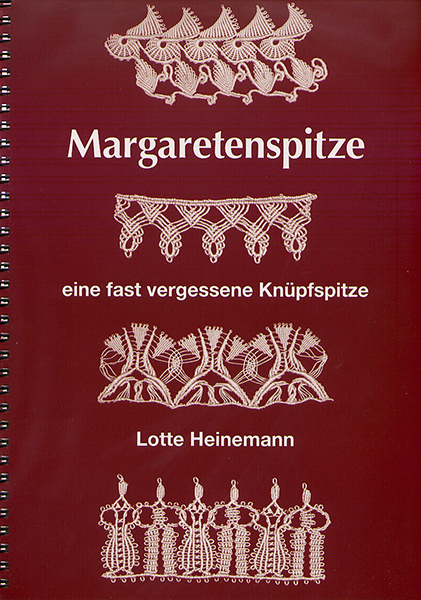 For those of you who were intrigued by the Pizzo Margarete or Margaretenspitze knotted lace that I told you about in this post here, Lotte Heinemann has reprinted her book and has some essential parts translated into English (the book text is in German) which are available in an insert along with some graph paper for you to chart your own creations. 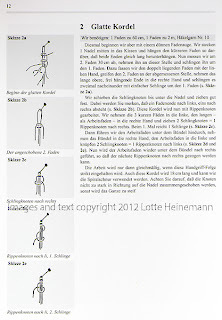 As this technique is originally a German one, I thought that maybe those of you who may want to delve further into it would like to know of this book's reprinting. The book is 147 pages and coil bound which is nice for referencing while you are working. 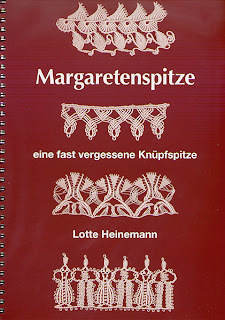 The English insert is 7 pages long and highlights the essential information you will need for working the lace. 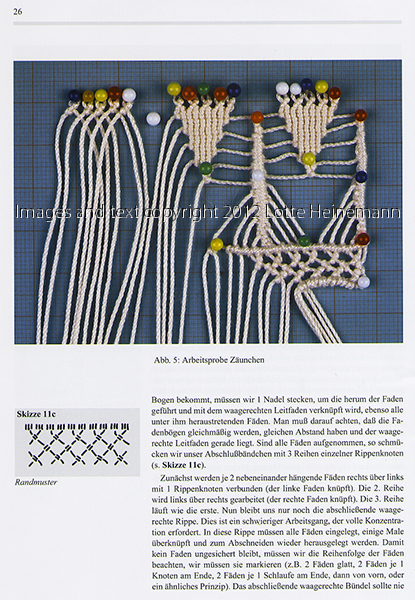 If you have some experience with Macramé, this will be a valuable volume to add to your collection. For those of you who speak German, I would say this is the bible on this technique. You can order it from this website, clicking on some of the links produces the option for English text, the book is pictured on the link Literatur und Links. You must request the English insert as it is not automatically included. 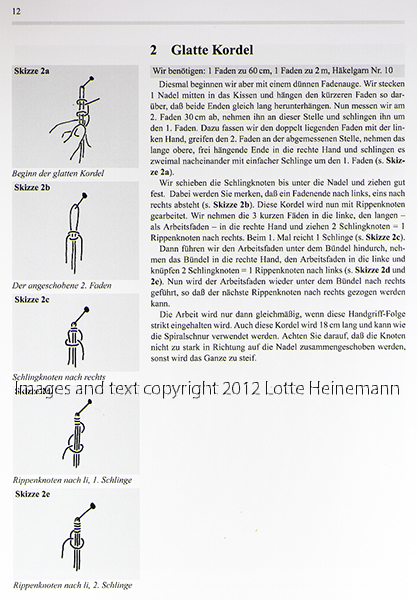 Lotte Heinemann tells me she and a friend are working on a beginner's book for this technique to be published in English and German. She will keep me posted and I will pass on any information that I receive. 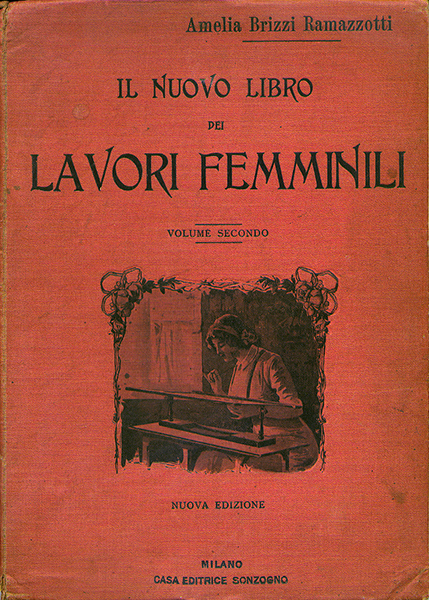 Thanks to a very generous and kind friend in Italy, I have, at last, the second volume of this old needlework encyclopedia: Il Nuovo Libro dei Lavori Femminili, Volume Secondo [The New Book of Woman's Works, Second Volume] by Amelia Brizzi Ramazzotti, Sonzogno, Milan. I believe that it was printed in 1914 though I can't find a date in the book. I told you about the first volume in this post here. 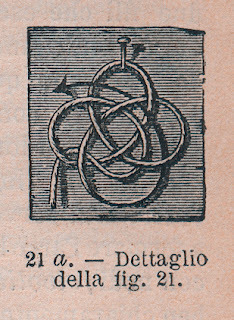 The second volume is full of references to Italian needlework as well as traditional widely known techniques. 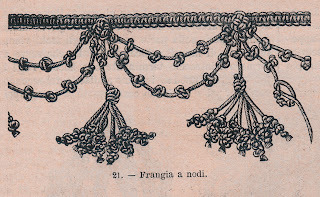 It has 10 sections: Embroidery on Tulle, Filet Lace, Knitting, Crochet with a subsection on Hairpin Crochet, Macramé, Tatting, Bobbin Lace, Renaissance Lace with subsections on Brussels Lace and Cluny Lace, Tenerife Lace, Needle Lace with subsections on Reticello, geometric Aemilia Ars Lace and Venetian Point Lace including Gros Point. The last page is an ad for Cartier-Bresson thread which lists the appropriate threads to use for the various techniques and how they are (were!) available, eg. in skeins, balls or spools. It says that the design must be laid out on paper or fabric and attached to a support for execution much like that of Embroidery on Tulle. First you attach the tape and then go about filling in the leaves and medallions making sure to catch the filet netting below. This is definitely a different approach to Filet Lace! 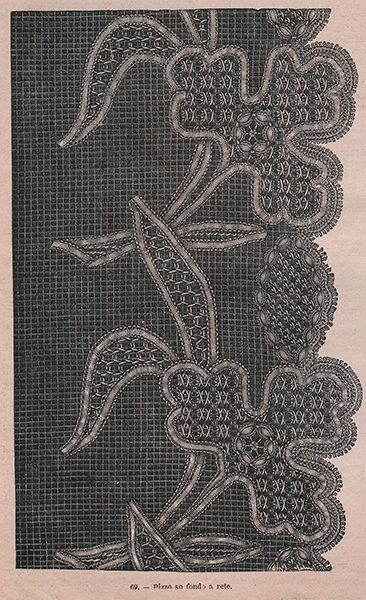 I used to write the newsletter for my local embroidery group and so I subscribed to many needlework newsletters and messageboards as sources for the latest news and products to report to the membership. 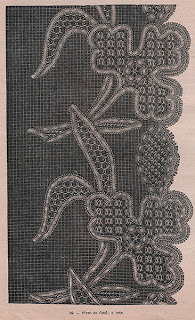 Years have past and I no longer write the newsletter but I'm still subscribed to the various needlework newsletters. 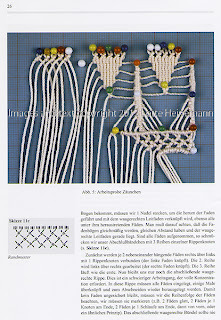 Imagine my surprise to open the April 8th Nordic Needle Newsletter and see that the feature article was on Punto Antico and cited my blog and article for Piecework! It is rather startling to open an email and view your own photo staring back at you. I'm very glad to see that people are interested in Punto Antico here on this side of the Atlantic, Nordic Needle is a needlework store in the state of North Dakota in the US. In the newsletter they provide links to a designer called Gingerbread Girl who has designed some contemporary patterns for using Punto Antico stitches (follow the links in the newsletter to see them). I couldn't find out anything about Gingerbread Girl so unfortunately I can't tell you about her or her kits. There is only one thing I wanted to add to what Debi says in the newsletter. 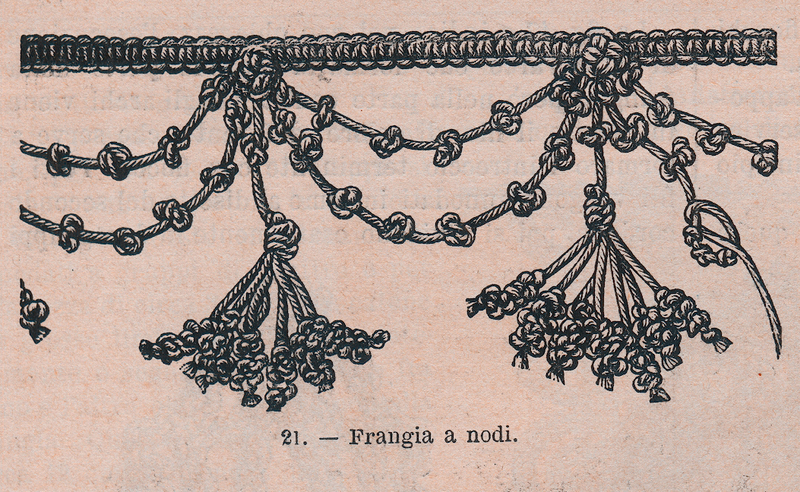 While it is true that Punto Antico has become most commonly practised as a counted thread technique, it is also still done as a freestyle technique in Italy. 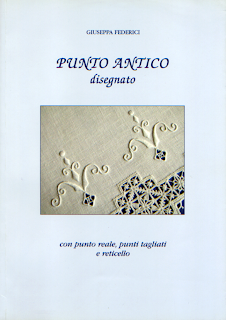 There is a delightful book called Punto Antico disegnato by Giuseppa Federici which describes how this technique is executed as a freestyle embroidery. 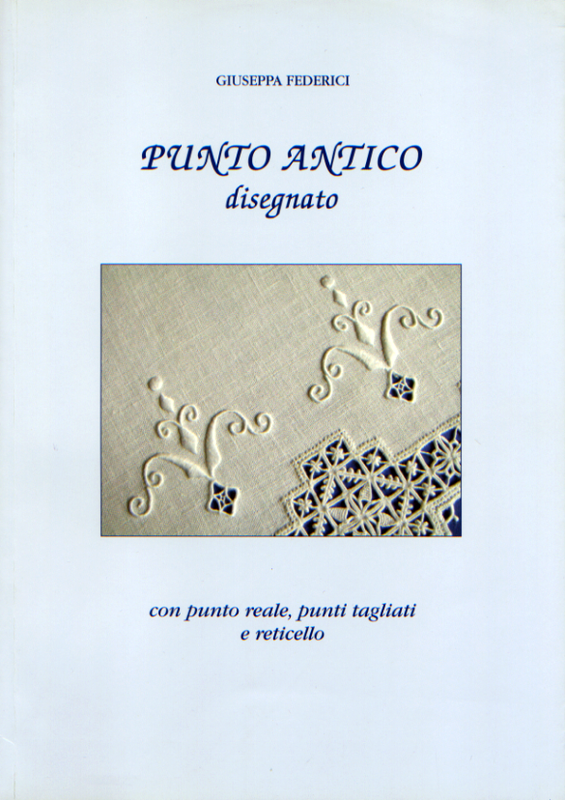 The text is only in Italian but the step-by-step colour photos are easy to follow and there are over 50 patterns, motifs and designs - some of which use Cutwork and Reticello designs to compliment the Punto Antico stitches. You can order this book from Tombolo Disegni, send an email request to order. If anyone knows anything about Gingerbread Girl designs, will you leave a comment below? It's funny how the mind works. For months I've been searching for biographical information on Rosita Levi Pisetzky always turning up empty. I finally decided to post what I had, believing that I couldn't find out any more without visiting some Italian archives, perhaps in Milan. I received a comment from a reader this morning that said she had spoken with a descendant of Rosita Levi Pisetzky about 10 years ago on the phone in Milan. Sitting down at my computer after work today, I suddenly decided on a different set of search words and bam! I finally discovered something. Not searching in the field of textiles at all, but searching in the history of Milan. On the website Storia di Milano, the death (in Milan) of Rosita Levi Pisetzky is listed as an event on the 18th of January, 1985. 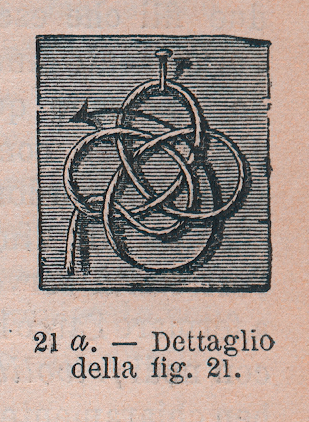 Inputting the event sentence as written on the Storia di Milano website into Google produced a link to the bookseller Maremagnum which had a rather informed bit of information on the author of the encyclopedia set that I told you about yesterday including her birthdate of 1898. This means she published the history of costume in Italy encyclopedia set when she was about 66 years old... and the book that I have, Il costume e la moda nella società italiana when she was 80! Levi Pisetzky, Rosita (1898-1985) Clothing historian. An intellectual from the Milanese upper-middle class, she was defined as "The Lady of Italian Costume" by Guido Lopez in an article written after her death in 1985. A self-taught historian with a life passed in studying archives, literary texts and iconographic sources, she published the most important treatises on the history of costume in Italy. Her first studies came out between 1937 and '38 in various women's magazines and journals. The articles on the history of the lace of that period remain notable for their careful research. Between 1954 and '62 she wrote about the history of costume in the various epochs for the "History of Milan" published by Treccani in 16 volumes. These studies were expanded and then printed in a work of five volumes edited by the Italian Editorial Institute under the title "Storia del costume in Italia" between 1964 and '68. 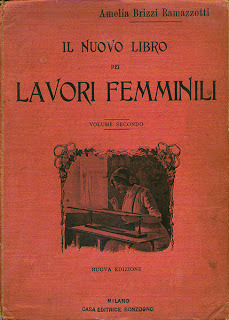 In 1978 Einaudi published "Il costume e la moda nella società italiana", further development and updating of her historical research. She was the first to treat the subject in a serious way, studying dress as a means of communication and social document. In her later years, she donated her own specialized library to the Collection of Bertarelli Prints of Milan, and her collection of vintage clothes to the Civic Collections of Applied Art of Milan, both located in the Castello Sforzesco, where they are still accessible today. After her death, her wardrobe was donated by her family to the Bertarelli. It is an interesting collection of tailored garments of Milanese manufacture from the 1950s and '60s. Now isn't that a treasure trove of leads to follow up? I've been to the Castello Sforzesco in Milan too, and obviously didn't understand what I was looking at or missed it completely! I'll have to go back! Castello Sforzesco in Milan. Image from Wikipedia. I hope this gives those who are interested some more to go on. I'll post again when I've got more info. In the Burlington Magazine Vol. 112, No. 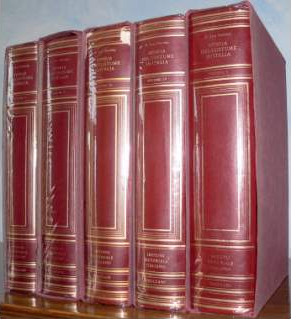 807, June 1970 there is an enthusiastic and extensive review (in English) of the encyclopedia set by E. H. Ramsden. 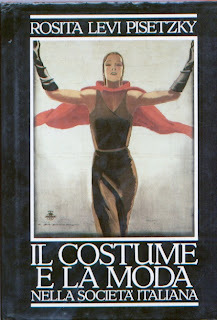 While I can't get my hands on this body of work, I did find another book by Rosita Levi Pisetzky called Il Costume e La Moda nella Società Italiana [Costume and Fashion in Italian Society], 1978 Giulio Einaudi Editore. It totals 383 pages and includes a detailed index. 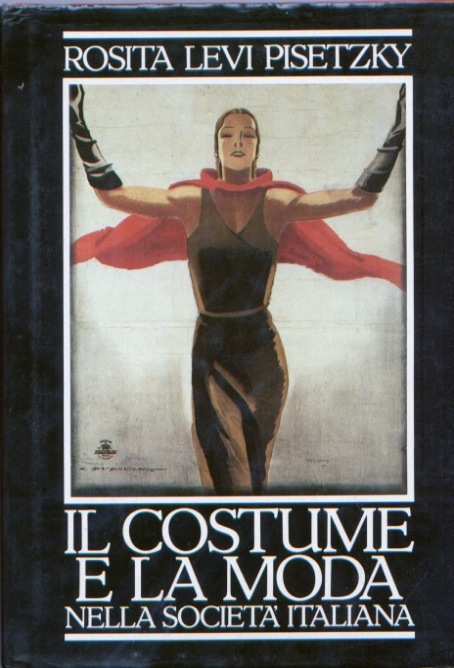 The book is divided into two sections, Le forme della moda [The Shapes of Fashion] and Il costume nella storia [Costume in History]. Each section is then further divided into subsections covering periods from Roman times up to 1900. I like that it is specifically about Italy and Italian fashion and clothing and it makes me want the series of encyclopedias I mentioned above all the more. In the single volume that I have is a middle section of mostly black and white photos of statues and painted works of mostly Italian examples of clothing and accessories throughout the period covered by the text. It is full of interesting topics like the symbolism of colour, the origins and names of fabrics and particular attention is paid to accessories. Very useful for those who are recreating period costumes. I have been completely unsuccessful at finding out anything about the author herself. On the back cover flap of the book that I have it says: She devoted constant attention and passion to the problems of the history of fashion and costume in her Milan and Italy. Among her numerous works are: La Storia del Costume in Italia, Il Gusto Barocco nell'Abbigliamento, Storia del Fazzoletto, Come vestivano i Milanesi. [...] She died in 1985. I also accessed an online edition of a magazine called "Quaderni grigionitaliani", Volume 16, 1946-47, which has a five poems by Rosita Levi Pisetzky. The footnote after her name says she was an italian refugee and passed many years in Roverado di Mesolcina (Switzerland?) and that she had already contributed poems and tales to the magazine. A quick search of the database however produced no results for her name at all, not even the one in Volume 16. I'm thinking that her name suggests she may have been Jewish and if she was from Milan, she will have had to flee during WWII but I will have to do more research as this is only a theory. I would love to know the story of her life and what led her to produce this amazing body of work on Italian fashion and costume. If you know anything further I'd love to hear from you!